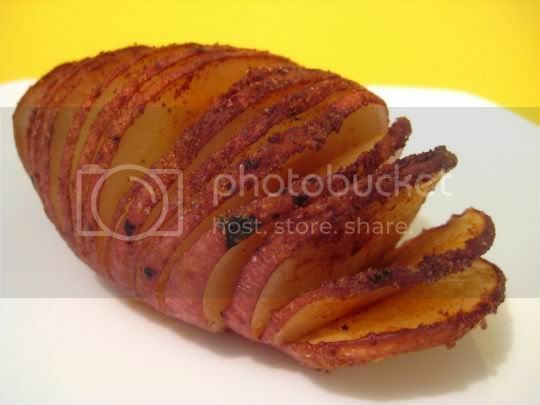 An interesting variation on the baked potato, this dish is pretty to look at and would make a great entree accompaniment...but isn't necessarily worth the time. Take a few medium-sized red potatoes, and cut them into "fans" that will spread during baking. This is the first part of the messy and time-consuming prep you'll have to endure. The recipe suggests using the chopsticks method, where you put the potato (which has been cut to lay flat on the bottom) between two chopsticks, in order to prevent the knife from cutting all the way down. But I think a careful eye and steady hand will fare just fine (and who has chopsticks lying around anyway?). Next, you'll have to carefully separate each slice and brush olive oil in between them, followed by a liberal sprinkling of a salt and paprika mixture. Your fingers are going to get very messy, so be prepared. The potatoes then bake for an hour, and you end up with a pretty, unique side dish, ready to be topped with anything of your liking: sour cream, salsa, cheese, gravy, whatever. As far as the taste goes, it's your standard baked/roasted potato that's liberally salted (I wouldn't say TOO much salt, but you certainly won't need any extra seasoning). The tops of the slices are cripsy, the bottom crunchy, and the insides are perfectly cooked, being firm but tender. Make again? Possibly, if I was trying to impress someone with a culinary visual effect.